With the extended break and nowhere to go, I would normally be sewing up a storm. However, this week I have had a bit of a distraction…. 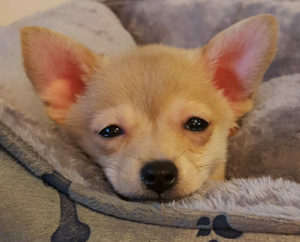 Our family has a new addition, Jynx, an 8 1/2 week old Pomchi (a Pomeranian\Chihuahua hybrid). She pretty much has two modes, high energy play and dead to the world asleep so taking a good photograph of her is next to impossible, but here she is on the verge of napping. As you may have guessed, she’s very much like caring for a newborn, so most of my day has been devoted to playing (and supervising), potty training (which has gone pretty well so far, knock on wood), and resting (because she is exhausting!). I have a feeling that once we all settle into a routine that she will become my sewing room buddy and maybe some inspiration to make a few dog items, too! As for sewing, I am attempting to finish up my last project of the year – a pair of Peek-a-boo Pattern’s Cozy Toe Socks! I have them about 3/4 of the way finished so I am fairly confident that they will be done before the new year arrives….. who knows maybe I might be able to squeeze in one more thing before 2017 arrives! This entry was posted in Uncategorized on December 30, 2016 by stacy. Get ready for Valentine’s Day by whipping up some of these awesome fabric Swedish hearts. Does your little girl need a new look, fast? Then be sure to check out this 10 minute skirt tutorial. Need a new look for you instead? Try this 1 Hour Tee. This wrap cardigan tutorial isn’t just easy to sew, it can be worn several different ways to change up your look. The Zip Zap Mini Pouch is the perfect size to hold all your essentials while sporting a great crossbody design. Channel the winter weather indoors with a pretty Nordic Winter Pixel quilt. Get your home back in shape after the holidays by organizing your living space with some of these peek-a-boo storage bags. These rag rugs remind me of my grandmother’s house – I’ve always loved how colorful they are, too. Who says ear warmers have to be boring? This tutorial shows you how to make yours look like a Unicorn or Narwhal. Stay warm with a new long sleeved shirt. Did Santa leave a new iPad under the tree this year? Protect it with a one-of-a-kind sleeve case. Everything really does have it’s place with this Tote with Many Pockets tutorial. Did you recently make yourself slippers? Why not whip up a matching toddler pair too? Keep the dust off your machines when you’re not using them after you stitch up a new cover. This entry was posted in Uncategorized on December 29, 2016 by stacy. In an attempt to become a bit more proficient with my Cricut machine, I decided to try my hand at ‘layering’ a design….. this is definitely much more difficult than what it seems and requires a good eye, steady hand, and a lot of patience. However, my first real attempt isn’t too shabby and I present to you my knock-off Starbucks mug. This particular design had a crazy 6 layers – each element had it’s own layer. 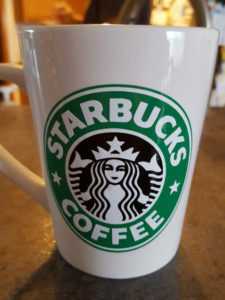 It’s not perfect, but I don’t think anyone is going to notice that it’s a bit off in spots either. It is a very thick design, but I managed to get it together without any bubbles…. now let’s see how it holds up over time! Now I think I’m ready to tackle more layers! This entry was posted in Uncategorized on December 28, 2016 by stacy. First up, Mermaid Tail Blankets! 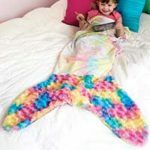 I’ve talked about this previously as this pattern along with a boy’s Shark Blanket and Mermaid Swim Tail are available as digital downloads in the Sew It All shop. All of the patterns are easy to create and sew up in a flash so they make great last minute gifts. These are sized for kids, but add a bit of length to the body of the blanket and it’s perfect for adults too. Also in the current issue are the instructions to make a Cocoon Knit top from a purchased pattern. It’s fun and cozy and is perfect to wear as a sporty workout top or dress it up and wear it out. This look is also easy to adapt as well and I think comes out with impressive results. Do expect to use more material than what the pattern recommends since there is a lot of crossover in the tunic and sleeves. Otherwise, you can easily whip this up in about a day. I can’t wait to see everyone’s versions of these patterns! This entry was posted in Uncategorized on December 27, 2016 by stacy. Now that the holiday crafting rush is over, I can finally get back to some selfish sewing. Yesterday I decided I needed a fun new top that would go with a fun new pair of shoes that are waiting under the Christmas tree. In my mind, I wanted to find a shimmery sweater knit in a blue or pink, but since that was nowhere to be found locally, I searched my stash for something that was blue or pink…. I came up with this pretty blue doe print from Girl Charlee‘s Bolt. As for the pattern, I opted to go with George & Ginger’s Anniversary Top which has cold shoulder sleeves in a variety of lengths. With one yard of fabric, I had enough material to make the ‘elbow length’ version of this design. Overall, the top came together very well, but the fit is just a hair off. If you blow up the photo on the right some, you’ll notice a few gathers around the bust – it is a bit tight in this area even though my measurements put me in this size (it may also be the fabric, but I found that the Bolt designs actually have quite a bit of stretch, so I really don’t think this is what is going on). The other issue I had was the length – it was way too long so I wound up taking off 1 1/2″, but probably could have shortened it a bit more. The end result is a fun top, but sadly, I discovered the blue doesn’t really match my shoes after all. I’m wondering if anyone will really notice? As for the pattern, I will probably be making this one again, but one size up. I saw this pattern used with a panel that I recently purchased and it turned out so cute that I have to make it. This entry was posted in Uncategorized on December 23, 2016 by stacy. Looking to make a cute, last minute stocking stuffer? Then hurry and grab this fun Agne Coin Purse pattern while it’s free! The bohemian trend is still going strong, stay in style with this ruffled boho blouse. These Scandinavian Fabric Stars would make beautiful ornaments or package decorations. Need a gift that’s fast to sew, but looks like you spent ages on it? Then be sure to check out this quilted tote. While you’re on the site, make sure you enter to win her current giveaway for Kai scissors and seam allowance guide tools! 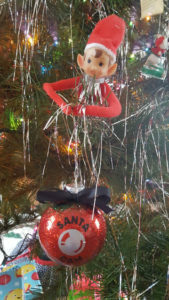 Learn how to make these beautiful folded fabric ornaments that require no sewing at all! Know a child in the hospital? Make them a matching hospital gown and scrubs for their bear. Learn how to make belts, bracelets and headband gifts in minutes – they make great stocking stuffers! While you’re there be sure to enter in Sew4Home’s giveaway for a fabric and thread gift set! Add more holiday to your table with these pretty cutlery pockets or this festive snowman holder. This festive Santa Scarf whips up in under 15 minutes and is a fun way to stay warm this holiday. Looking for something more traditional to wear? Then check out her reversible poncho tutorial which is also quick and easy to make! I think I squealed a little when I saw this AT-AT plush tutorial – just in time for Rogue One. Winter weather got you down? Warm up with these cactus pillows (plus they’re no sew)! Know a runner or just someone who needs to carry their phone and still be hands free? This arm band phone pouch is the perfect solution! These little pouches aren’t just quick to sew, but they’re fat quarter friendly too. A few Christmases ago I went on a casserole carrying gift making binge. I didn’t use this tutorial, but it looks equally fun to make! This entry was posted in Uncategorized on December 22, 2016 by stacy. 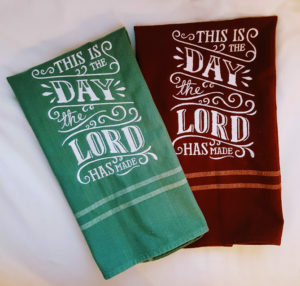 As much as I love handing out these tea towels as gifts, I think I’m safe in saying that I hate making them…. mostly because it’s just tedious work. 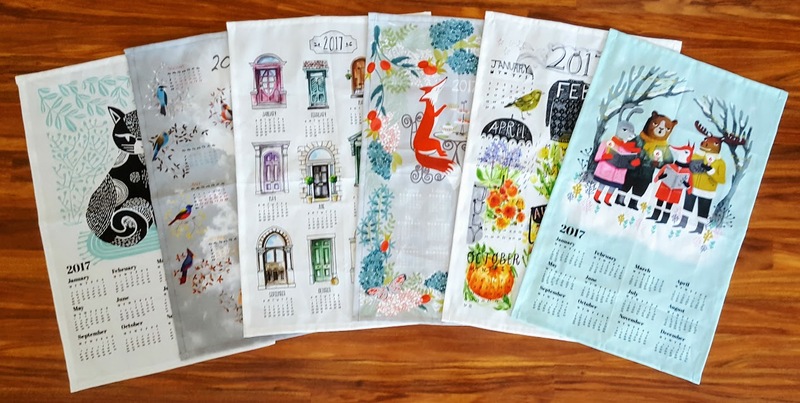 With that said, I am proud to present to you the 2017 Tea Towel Calendars! This year I made them for family, Easton’s teacher (I tied it up with a wooden spoon and paired it up with an ornament) , and of course, one for myself. I liked the way Spoonflower printed these off this year, as I was able to do a nice 1/2 finished seam on all of these (last year I had to do a 1/4″ hem otherwise I was folding back part of the design on a few towels) which definitely made for easier sewing…. which was a good thing because I was definitely working on these up to last minute gift giving yesterday! Anyone else doing last minute holiday sewing? This entry was posted in Uncategorized on December 20, 2016 by stacy. The past few days I have been (attempting) to get ready for the holidays: Wrapping, baking, and last minute crafting. First up, my attempt at glittered ornaments (I had mentioned these in a recent Linky Thursday post). Instead of using Mop ‘n Glo, I had read that a polyurethane actually worked better in setting the glitter…. and we had it on hand! I will admit, the first round was not great – I learned that making sure your alcohol cleaned ornaments are properly dried is key, ‘sampler’ tubes of glitter does not provide enough coverage (go for the larger bottles), and that dropping one on the floor is every bit as messy as what you think it might be. A second round (not pictured) had a lot better results and I learned that polyurethane sticks just as well to plastic ornaments (which seemed like a wiser choice after breaking one and cleaning up the glitter mess) as what they do to glass! 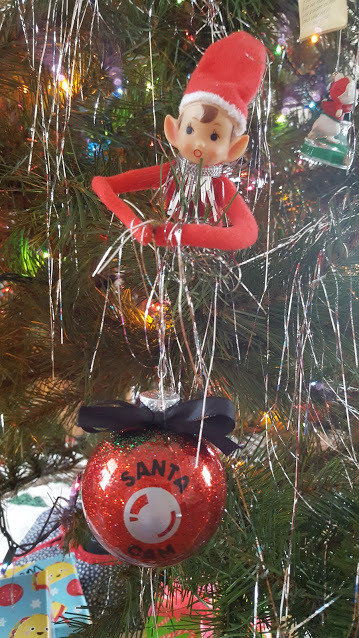 As for the decoration, I added various themes to the ornaments (generic holiday messages with the year, college logos, and this fun Santa Cam globe). I also made a few more shirts! 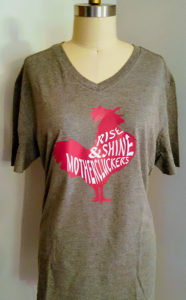 I couldn’t resist whipping up this Rise & Shine tee because I thought it was so funny. I’m currently using it as a sleep tee and love it. 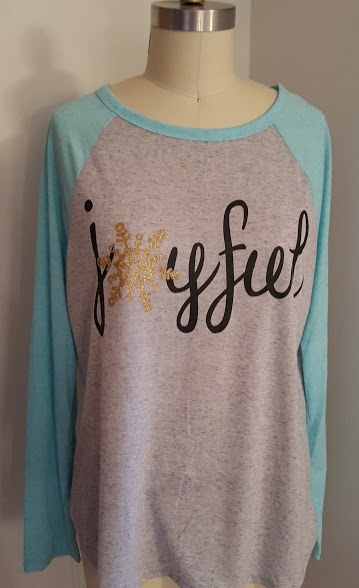 I also made a second Joyful top (you can see the previous version here). I went with a slightly larger image on this one and I think I like it even more. This entry was posted in Uncategorized on December 19, 2016 by stacy. Know someone who loves to camp? Gift them an adorable camper ornament to hang on their tree. Keep your tootsies warm with a cozy pair of fleece lined slippers. Looking for great little stocking stuffer gifts you can sew? These lip balm case and key rings are perfect for anyone (and would be great to attach lip balms to kid’s backpacks). A cute way to dress alike, the colorblocked mommy and me tunic. I might actually make the mommy version for myself! Here’s a bit of a twist on the blanket scarf trend: an easy cap scarf. These colorful fabric bracelets make great gifts or just stack them and were some yourself. 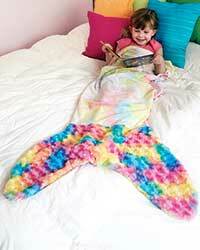 I have a deep desire to make something with color changing mermaid sequin fabric…. but I dread working with sequins. Get tips and trick with working with this tricky material in this post. Big kids need Christmas jammies too. This free pajama pant pattern (sizes 10-16) is perfect for making handmade pjs for tweens. If you have a wine lover in your life (or yourself) you’ll definitely want to whip up a few of these fun ornaments. Not a wine lover, but can’t pass up a taco truck? Check out this taco ornament, instead! These dish towels stay put when you hang them on your oven door. If Elf is one of your favorite Christmas movies, you will definitely want to check out this adorable tree skirt inspired by the movie. This canvas Christmas pillow is perfect for indoors and out. This Santa pillow is pretty stinkin’ cute too. This isn’t just a tool holder, it’s also an easel for them too! (Change up the pocket size and this cold also hold makeup brushes, instead). If you love the look of quilted stockings, but don’t have the time to do all the work. Try you hand at these quilt as you go style stockings, instead. Put those fancy stitches on your machine to good use with this beautiful cross body belted bag. These reindeer candy cane holders would make a fun, and easy treat bag or stocking stuffer gift. I’ve been on an underwear making kick lately. Interested in trying your hand at it, too? This free (kids) boxer brief pattern can get you started. This entry was posted in Uncategorized on December 15, 2016 by stacy. Yesterday was fairly productive day in the sewing room, as I finally finished up two projects. I had mentioned in yesterday’s post that I have been multitasking, but I should probably add that I’m not sure that it makes things go any faster. I find myself hopping back and forth in between projects enough that I never feel like I’m really accomplishing anything. With that said, here’s a peek at what I’ve been working on. 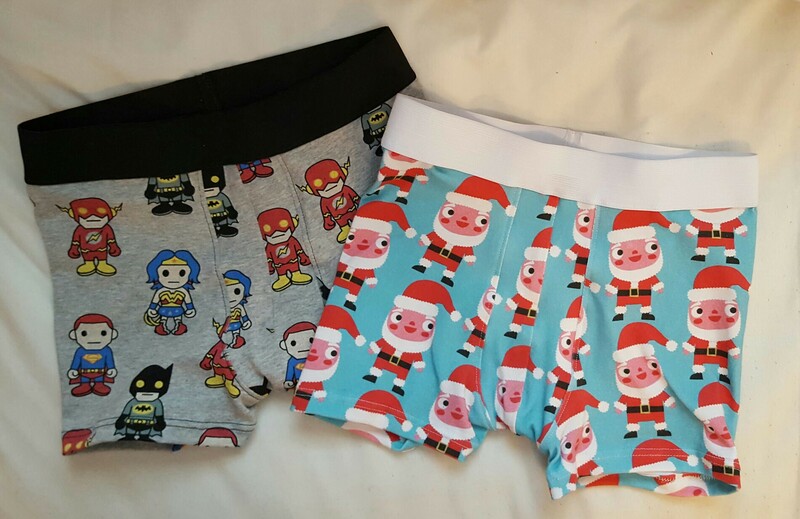 First up, more boxer briefs. Given that one of these was a seasonal print, I figured I needed to get these done before the 25th so Easton could wear them before the holiday. I went up one size from the pair I made last week and I think that it has a much better fit in the legs. I’m not sure how the superheroes will work out, the material is much less stretchy than the others I’ve been working with. I also finished up a few sets of the embroidered tea towels for Easton’s religious education teachers. One thing I wanted to point out on these is the difference that I noticed in the stabilizer I used. The maroon version has a tear away. While the overall design looks ok, It doesn’t lay as flat and isn’t as ‘smooth’ as what I would have liked. In the green version, I used Vilene water soluble and I think the end result is more polished. I know that in the end I should have used a cutaway (if they plan to launder it and not just use them for display), but I didn’t have any on hand and decided to make do with what I had. This entry was posted in Uncategorized on December 14, 2016 by stacy.